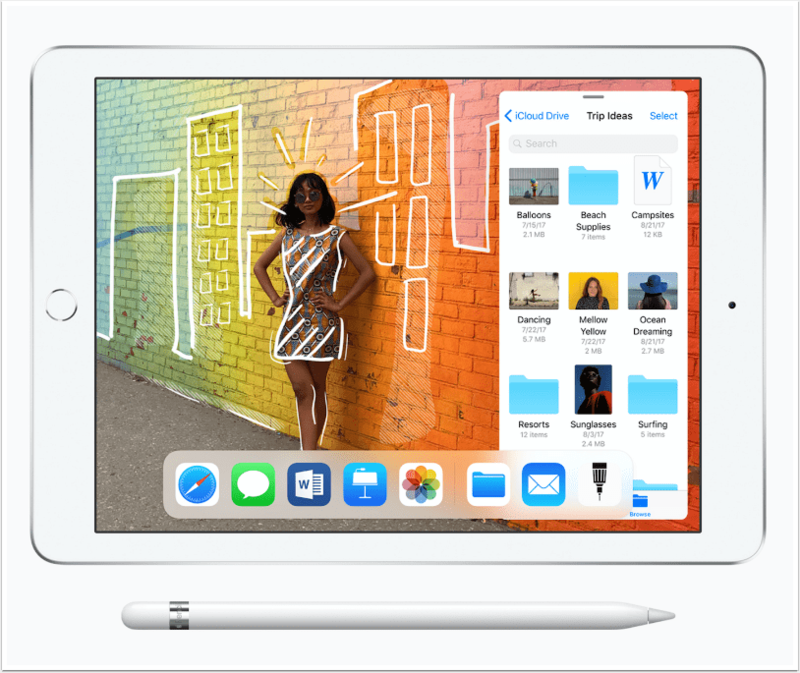 The new iPad features the Apple-designed A10 Fusion chip with 64‑bit desktop-class architecture, delivering 40 percent faster CPU and 50 percent faster graphics performance for seamless multitasking and graphics-intensive apps. ** The front- and rear-facing cameras offer exceptional low-light performance and HD video recording for document scanning, moviemaking and FaceTime calls. — iPad comes in silver, space grey and a new gold finish and starts at an Apple retail price of $329/£319 for the 32GB with Wi-Fi model and $559/£449 for the 32GB Wi-Fi + Cellular model at Apple.com and Apple Stores. It is also available through Apple Authorised Resellers and select carriers (prices may vary). For more information, please visit apple.com/ipad. — Apple Pencil is available for purchase separately for $99/£89. — Schools can purchase iPad for a discounted price. — Smart Covers for iPad are available for $39/£39 in charcoal gray, midnight blue, (RED), white and pink sand at Apple.com and Apple Stores. — Every customer who buys iPad from Apple will be offered free Personal Setup, in-store or online, to help them set up email and iMessage, download apps from the App Store and more. — Anyone who wants to start with the basics or go further with their new iPad can sign up for free Today at Apple sessions at apple.com/today. ** When compared to the previous 9.7-inch iPad. *** Network speeds are dependent on carrier networks. **** Not all carriers support Apple SIM. See your carrier for details. Not available in China.